This is the time that elapses before new requests are sent to the server. The drop-down list allows you to define the time unit in milliseconds, seconds, minutes, or hours. 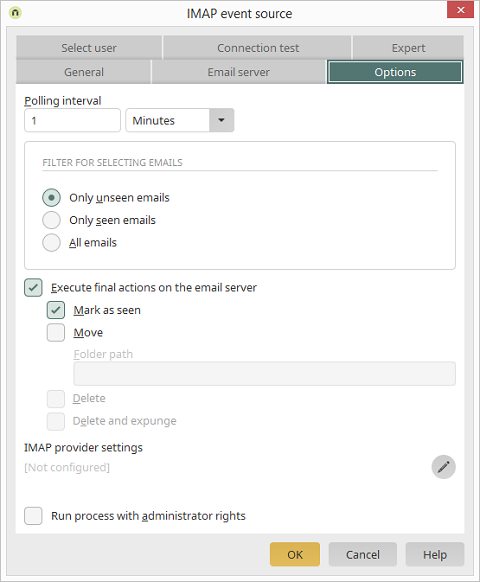 If the status of the processed emails is changed in the IMAP event source by a final action in the configuration dialog or with a Groovy script in such a way that the filter condition no longer applies, then the IMAP event will be executed again and again for the first email taken from the results of the request – and this will not happen at the next time of execution, as defined by the polling interval, but immediately. It's intended that it is not compulsive to select a final action in the dialog. In that case, a final action should definitely be executed with a Groovy script. It should be ensured that the filter condition for selecting emails no longer applies to the processed emails after the process has been executed. The condition is a combination of the folder path and the filter (see above). Therefore it is always sufficient to move an email to another folder or to delete it. It's equally sufficient to, for example, label emails as deleted. If unread emails are filtered, then it is sufficient to mark them as read. The filtered emails are marked as read. Moves the emails to the folder path defined here. Enter the corresponding folder path here. The filtered emails are marked as deleted. The filtered emails are deleted. have massive effects on the contents of the selected folder. We only recommend these settings for mailboxes specifically set up for this purpose. United Planet assumes no responsibility for errors that result from choosing the incorrect setting here. The provider settings can be configured here. Opens a dialog where the settings can be edited. If you choose this setting, the process actions are run with the corresponding administrator permissions.